Today, Durrington Walls is a field surrounded by banks. How do you carve up a cow? First you cut the meat off the bones. You start by severing the muscles from the joints with a sharp knife. The fibrous meat can then easily be scraped off, from top to bottom. After you’ve removed the flesh there’s still a lot of goodness left. Deep in the long bones and vertebrae lies the marrow. To get at this delicacy you smash the bones and scrape out the marrow or simply boil it out in water. What’s left is a pile of naked bones with traces of scratching and scraping as well as the small debris of bone that contained marrow. Archaeologists found just such a pile — a huge one — when they were excavating a Stone Age settlement in the small town of Herxheim in south-western Germany. The only difference is that the bones aren’t from cattle. Researchers found the carefully scraped remains of some 500 humans, and they haven’t even excavated half the site. “We expect the number of dead to be twice as high,” said Andrea Zeeb-Lanz, project leader of the Cultural Heritage Agency of the state of Rhineland-Palatinate. That’s a lot of corpses for a tiny Stone Age village. 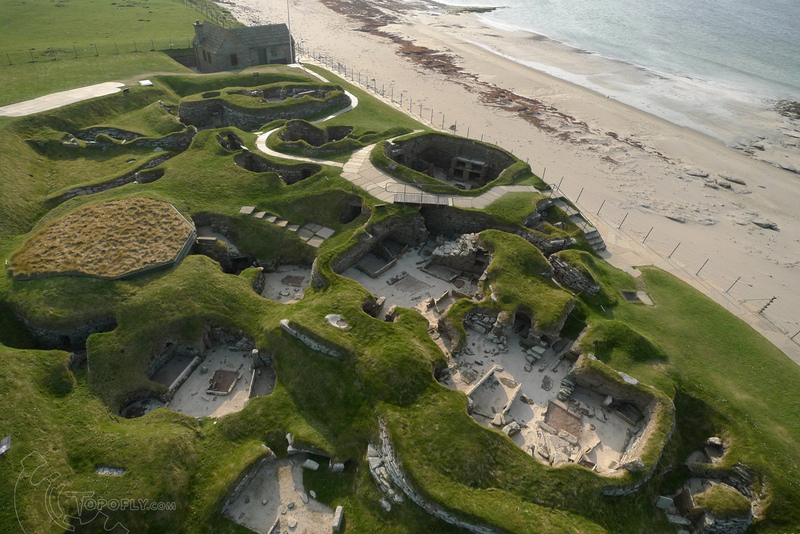 There were 10 buildings at most here in the last phase of the Linear Pottery culture of the European Neolithic Age around 5,000 to 4,950 years BC. The corpses weren’t native to this area, researchers have discovered. They came from all over Europe — from the area of what is now Paris, from the Moselle River 100 kilometers to the northwest and even from the Elbe River valley some 400 kilometers away. 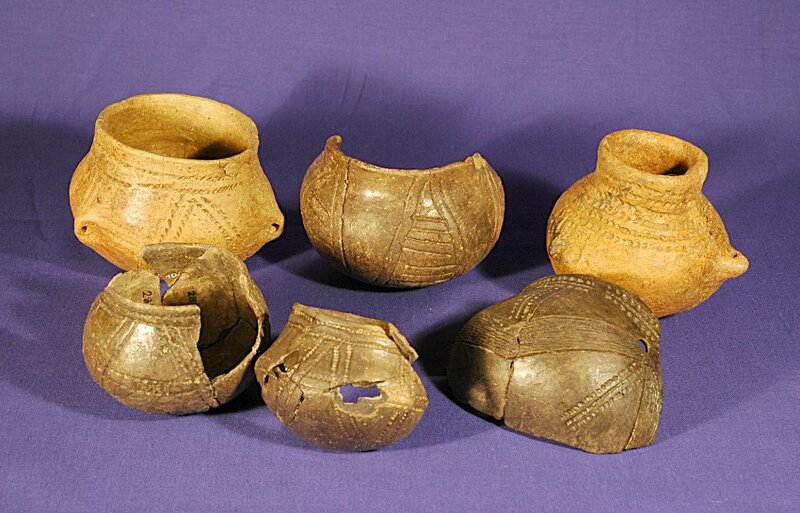 The broken bits of pottery lying between their ribs reveal their origin. 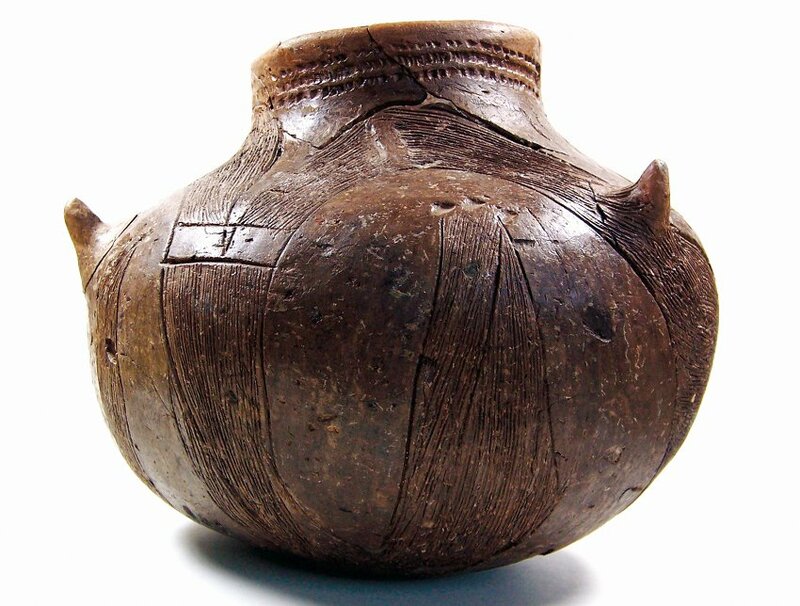 It’s the so-called Linear Pottery that gave the entire population group its name: decorated with linear patterns pressed into the moist clay while it was being made. The strangers brought only the finest pottery from their home regions — in many cases even more beautiful than the pottery they placed inside the graves of their own dead at home. But the pottery was smashed to pieces and scattered over the bones, along with brand new millstones and stone blades. Everything was hacked to pieces, broken up, mixed together and poured into pits. 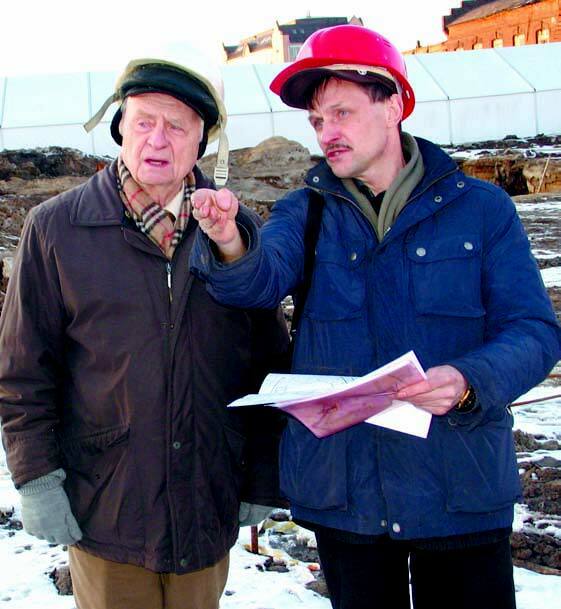 The anthropolgist Bruno Boulestin conducted a close examination of the bone fragments. He published his findings from one pit eight meters long in the latest edition of Antiquity magazine. 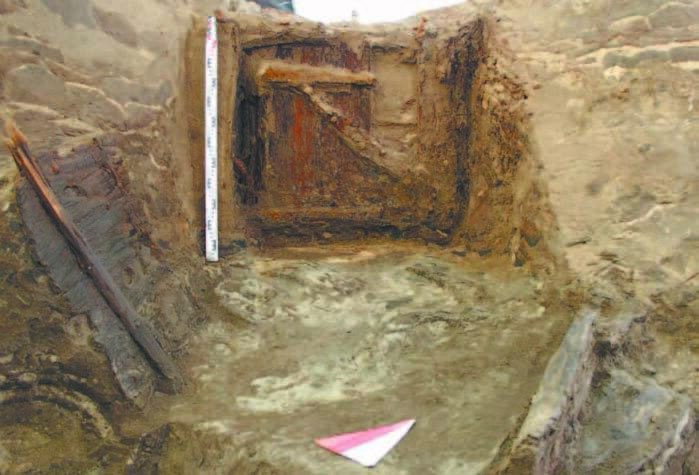 The pit contained a total of 1,906 bone fragments from at least 10 people. Two of them were infants or still-born children, one was a fetus in the 34th to 36th week of pregnancy, there were two children aged six and 15 and six adults, at least one of whom was male. All of them — babies, children, adults — were butchered by expert hands while the bones were still fresh, as the breaks and cuts show. Boulestin concluded that the human bones bore the same marks as those of slaughtered livestock, and that the dead of Herxheim were prepared as meals. He believes that marks on the bones indicate that body parts were cooked on skewers. His conclusions contradict other researchers who believe the meat was taken off the bones as part of a burial ritual, and wasn’t eaten. Who were the dead? Conquered enemies perhaps? Probably not, because the bones showed no signs of battle wounds. None of the skulls found was smashed, and there were no arrow heads between the ribs. The dead of Herxheim appear to have been in good health when they died. Their joints weren’t worn down, their teech were in exceptionally good condition and there was no sign of malnutrition. The theory of conquered enemies also seems unlikely given that the small group of Herxheim villagers is unlikely to have vanquished people hundreds of kilometers away and dragged 1,000 of them back to their little hamlet in the space of just 50 years. “One could also imagine that people volunteered to come here and be ritually sacrificed,” Zeeb-Lanz told SPIEGEL ONLINE. So what happed in Herxheim at the start of the fifth millennium BC? It’s clear that the hamlet quickly came to fame. It had been a sleepy, uneventful place since the so-called Flomborn Phase around 5,300 years BC. 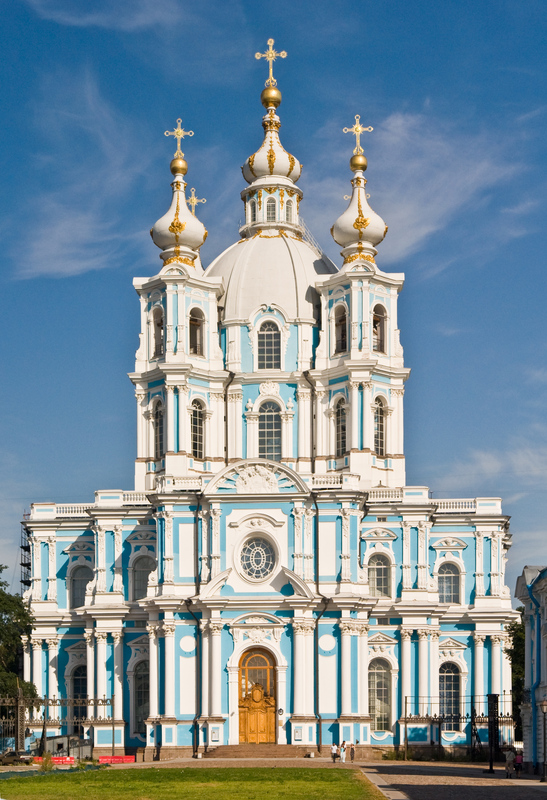 But around the turn of the millennium something happened that caused people from all over Europe to make pilgrimages to this place — a sensational feat of logistics and communication for that age. It’s clear that it wasn’t hunger that drove the inhabitants of this mysterious hamlet to carve up humans. What they did with their victims was part of a ritual, a religious ceremony. This includes the mysterious treatment of human skulls. First the skin was peeled off them. All it took was a cut across the length of the head and the skin could be peeled off the sides. Then a blow to the face at the front and the base of the neck at the back, and two blows each at the sides — the result looks like a drinking vessel. 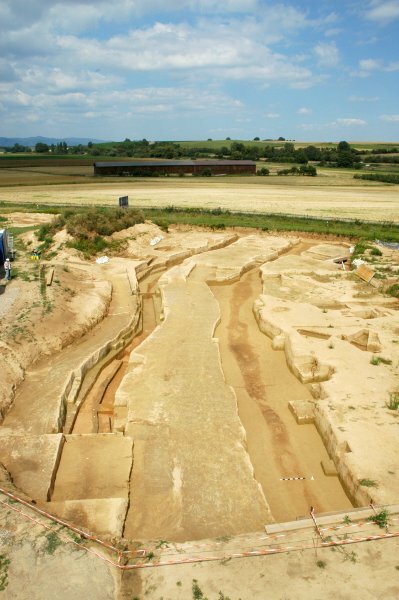 Herxheim offers rare evidence of cannibalism during Europe’s early Neolithic period, when farming first spread, the researchers report in the December Antiquity. 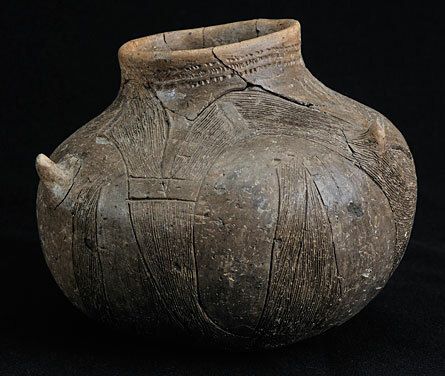 Artifacts found at Herxheim come from the Linear Pottery Culture, which flourished in western and central Europe from about 7,500 to 7,000 years ago. 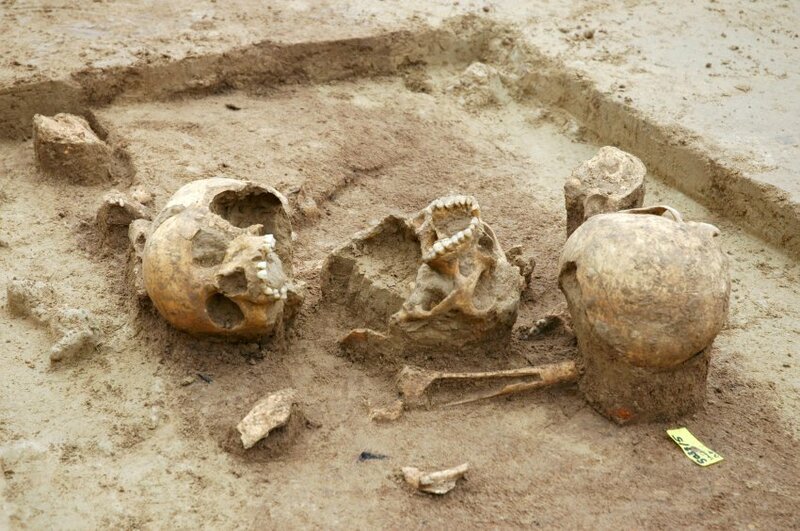 Two archaeologists who have studied human bones unearthed a decade ago at Herxheim reject the new cannibalism hypothesis. 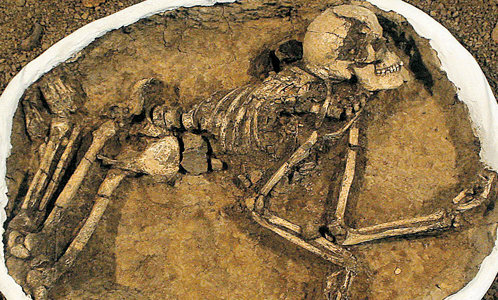 In a joint statement to Science News, Jörg Orschiedt of the University of Leipzig in Germany and Miriam Haidle of Senckenberg Research Institute and Natural History Museum in Frankfurt say that Boulestin’s evidence better fits a scenario in which the dead were reburied at Herxheim following dismemberment and removal of flesh from bones. Evidence of ceremonial reburial practices has been reported for many ancient societies. If further work confirms large-scale cannibalism at Herxheim, “this would be very surprising indeed, simply in terms of the scale involved,” remarks archaeologist Rick Schulting of the University of Oxford in England. Until now, the only convincing evidence of Neolithic cannibalism came from 6,000-year-old bones in a French cave, Boulestin holds. A 1986 report concluded that the remains of various a nimals and at least six people were butchered and discarded there. 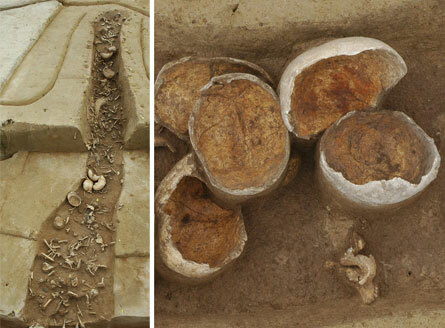 Again, Orschiedt and Haidle say, reburial rather than cannibalism may explain those findings. 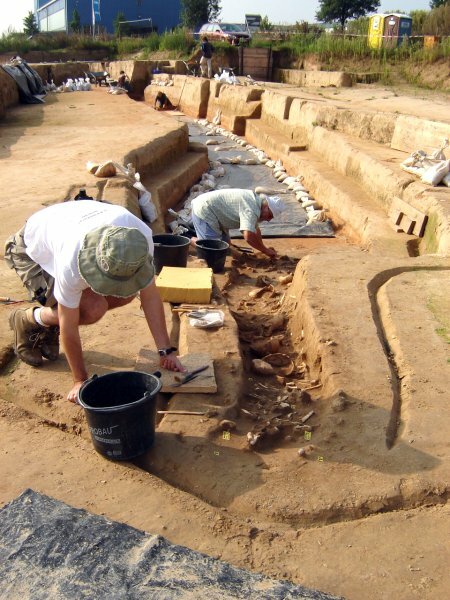 Herxheim was first excavated from 1996 to 1999, yielding remains of a large structure, pottery and what appeared to be two parallel ditches encircling the settlement. Closer inspection revealed that the ditches had been formed by overlapping pits that had been dug over several centuries, apparently not exclusively to hold the dead. Initial excavations of these pits yielded deposits of large numbers of human and dog bones. Work from 2005 to 2008 — led by Andrea Zeeb-Lanz and Fabian Haack of the archaeology division of Germany’s Directorate General for Cultural Heritage — unearthed additional human bones, mainly skulls and limb bones bearing incisions. 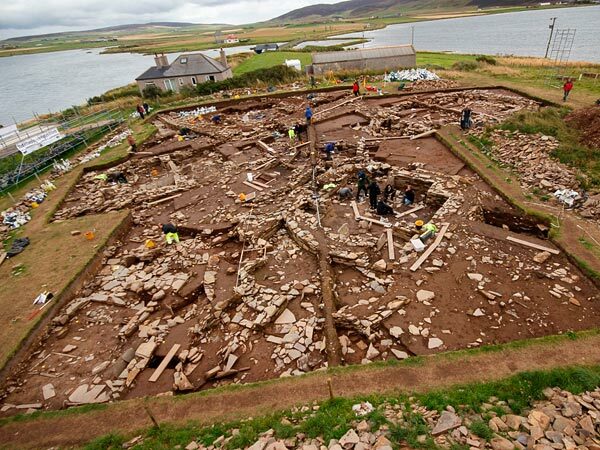 Remains of an estimated 500 people have been found so far. 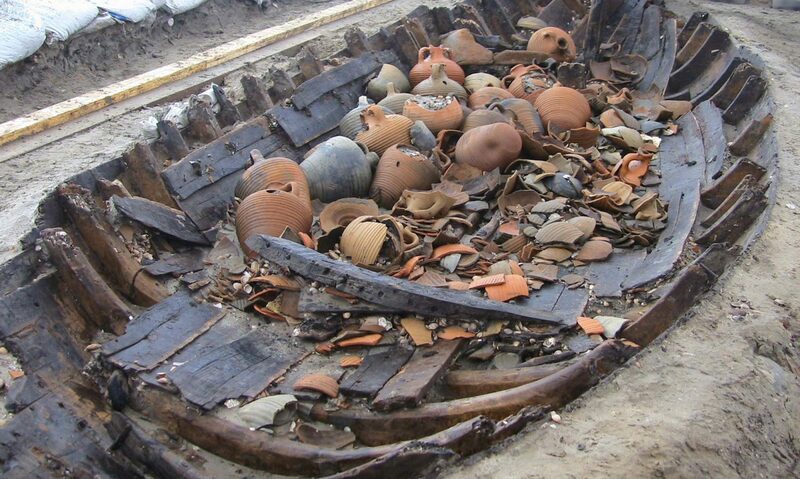 Pottery resting among the bones accumulated over no more than a few decades, the researchers say. 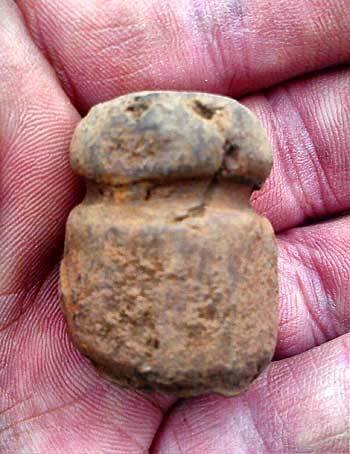 Some pieces came from Neolithic sites located 400 kilometers from Herxheim. The pits that surrounded Herxheim provided no protection from invaders but may have marked a symbolic boundary for a ceremonial settlement, Boulestin proposes. At first, Boulestin’s team, like Orschiedt and Haidle, thought that the dead were brought to Herxheim for ceremonial reburial. But Boulestin and his colleagues’ opinion changed after they analyzed 217 reassembled human bones from one deposit, representing at least 10 individuals. Damage typical of animal butchery appears on the bones, including that produced by a technique to separate the ribs from the spine, the scientists say. Heads were skinned and muscles removed from the brain case in order to remove the skullcap. Incisions and scrapes on jaws indicate that tongues were cut out. Scrape marks inside the broken ends of limb bones indicate that marrow was removed. People most likely made the chewing marks found near intentionally broken ends of hand and arm bones, Boulestin says. Ongoing work at Herxheim has found signs of cannibalism on the bones of hundreds of other individuals, with only a few exceptions, he adds. But proving that ancient Europeans consumed human body parts “is nearly impossible,” Orschiedt and Haidle assert. The absence of lower jaws and skull bases from the new Herxheim material favors a reburial scenario, the researchers say, in which these components were ritually removed before skulls were placed in pits. Boulestin’s notion of a Neolithic social and political crisis rests on generally accepted evidence of massacres of dozens of people at three central European sites approximately 7,000 years ago. Other regional settlements, including Herxheim, were abandoned around that time. 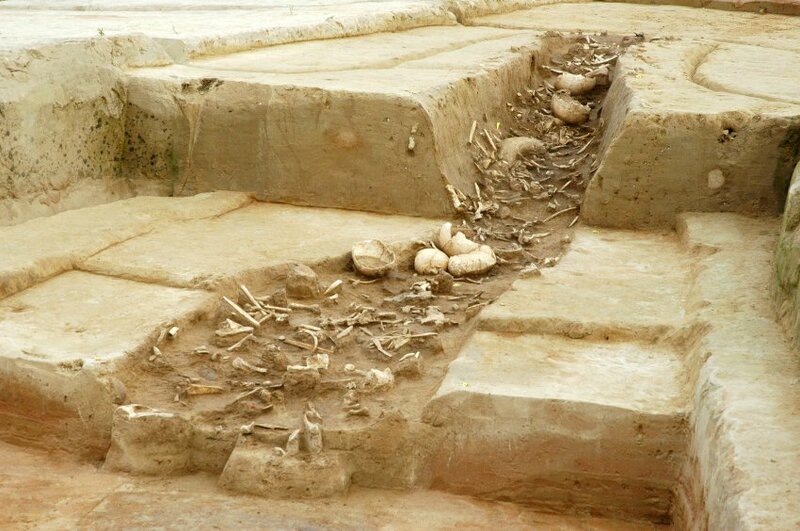 Planned chemical analyses of bones from Herxheim will indicate whether some individuals grew up eating foods from distant regions, a sign that they were transported to the site. Such evidence would support either a cannibalism or reburial hypothesis. 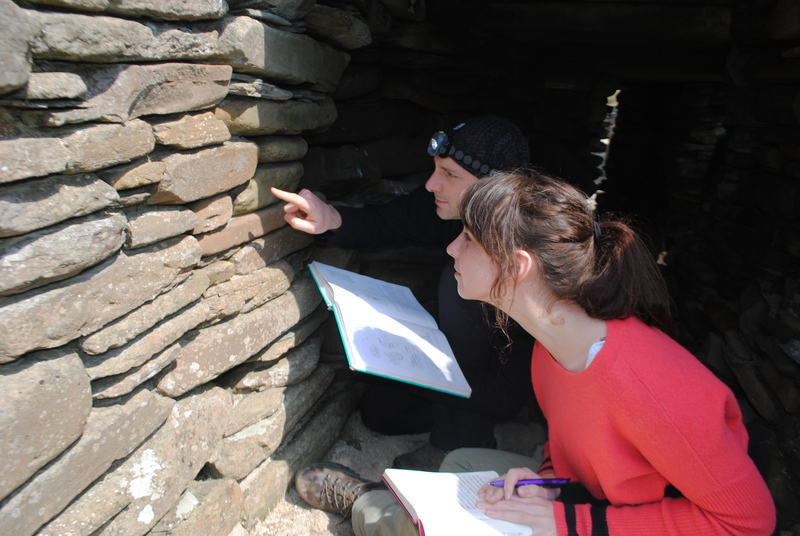 It’s not yet clear that a widespread crisis actually affected early Neolithic peoples, comments archaeologist Nick Thorpe of the University of Winchester in England. Whatever actually happened at Herxheim, facial bones were smashed beyond recognition, “giving an impression of the destruction of individual identity, a kind of psychic violence against the person,” Thorpe says.